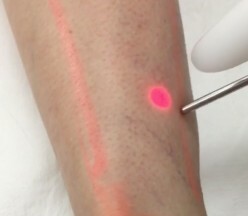 Fleming Laser can offer client on-site electrolysis training in the Melbourne area. Trudy has put together a program where theory sessions are offered by skype or Facetime then a series of hands-on training sessions ran in your own salon/clinic premises. This will be 1 on 1 training or small staff group [to be negotiated]. Classes will either be half day for 1 person or longer if there are a few staff attending. All models for hands-on training need to be supplied by trainee. Hair initially on legs then as the training progresses, you will treat bikini, under-arms and finally the face. Electrolysis needs many hours of practice to develop skill. I offer a series of face to face training sessions but the trainee needs to log at least 100 hours of independent practice between the supervised sessions. My classes a paid for per session and not as a fixed price course as everybody is different in their learning needs and speeds. The average requirement is about 10 hands-on sessions and 3 theory sessions, however this is customised to individual needs and the amount of sessions may vary. The overall time frame to complete this course is approximately 6 months but will vary depending on the booking of supervised training and how the unsupervised log of treatments progresses. A discussion with Trudy is needed before deciding on this training course. Contact us to find out more.